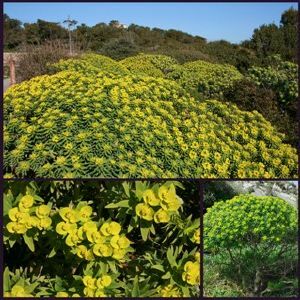 Euphorbia dendroides, also known as Tree Spurge, is an unusual and quite stunning shrub that grows in semi-arid and Mediterranean climates. A plant for the more adventurous to try whereboth space and a mild Mediterranean or maritime climate prevail, otherwise to grow as a conservatory plant. The flowers are yellow and the plants bloom from March to April. The flowers are arranged in typical cymes, and the shrubs can grow to a height of approximately 2 metres. Euphorbia dendroides, unusually is a decidious plant (most shrubby Euphorbia species being evergreen) with simple leaves, and the stems somewhat succulent in nature. The leaves are arranged in whorls and are lanceolate with entire margins. The autumn foliage can be very fiery and adds merit. Euphorbia dendroides is really a plant for more adventurous gardeners who have a favourable climate. It will withstand long periods of drought and requires a well drained soil in a sunny position where frost is a relatively rare experience. It will withstand a few degrees of night time air frost. Euphorbia dendroides can be grown as a specimen pot plant for the patio or conservatory and will perform well as a shrub in maritime gardens in our milder counties.